Fighting For Rwanda's Justice In France The first Rwandan genocide trial to take place in France sent a man to prison for 25 years last month. Dafroza Gauthier and her organization helped make that conviction possible. 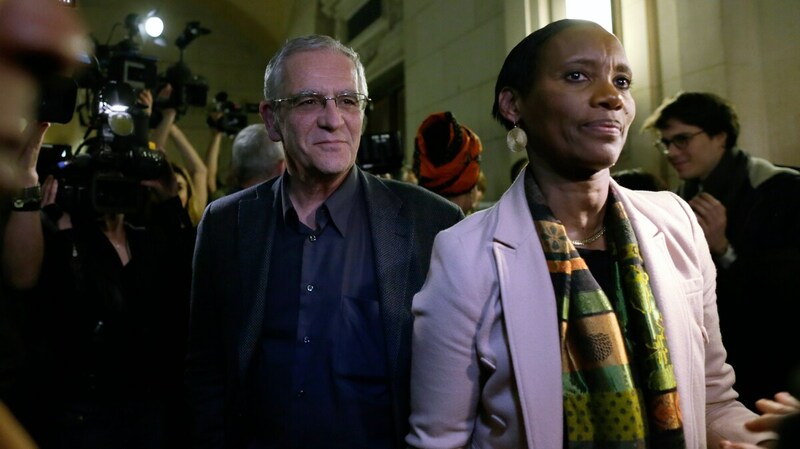 Dafroza Gauthier and her husband, Alain, leave the Paris courthouse on March 14, after former Rwandan intelligence chief Pascal Simbikangwa was sentenced for complicity in genocide and crimes against humanity. For more than a decade, Dafroza Gauthier and her husband, Alain, have hunted perpetrators of the 1994 Rwandan genocide. More than 800,000 people were killed in the genocide, most of them members of the Tutsi ethnic group. Earlier this month, the couple gave testimony against former Rwandan intelligence chief Pascal Simbikangwa in Paris. On March 14, Simbikangwa was sentenced to 25 years in prison for complicity in genocide and crimes against humanity. His was the first Rwandan genocide trial to take place in France. The conviction can be credited, in part, to the independent investigation conducted by an organization led by the Gautheirs, the Collective of Civil Plaintiffs for Rwanda. The group lends legal aid to victims of the killings in Dafroza's home country. Rwandan authorities had been searching for Simbikangwa, but it was a distant relative of Gauthier who recognized him. Then Gauthier's group had to gather evidence, and they gathered witness testimony in Rwanda. The sentencing was a "huge relief," she says, "a great weight off of our shoulders, and the end of a really long struggle of a very complicated situation here." "I decided to start doing this work in order to remember, to reconstruct Rwandans as a whole," she tells NPR's Kelly McEvers. Her own mother was assassinated during the genocide. Even before her death, the family has lost about 40 people. "They were shot, and they were killed with machetes," she says. Gauthier says there likely 100 people in France who are believed to be responsible for these types of crimes. Her organization has 25 cases now and is working on five more. In 2010, French President Nikolas Sarkozy visited Rwanda and said that the international community, including France, made "mistakes that stopped it from preventing and halting this abominable crime." He said France would seek out those responsible. "Upon his return, his government began the Office for the Investigation of Genocide to investigate solely the crimes of genocide," Gauthier says. "Since this group was created, things are moving much faster. They're moving really quickly. And there's a judge who is dedicated solely to the cases of the Rwandan genocide. ... Prior to this there was no money, there were no resources to focus on this and now there are." The week of April 7 will be a week of mourning in Rwanda to remember the genocide. "We'll be remembering the victims," Gauthier says, "and so I just ask that for this week you also think about the victims and their families."